Little girl with pig tail came running home and her little sister, also in pigtails, was just trailing her. With their big, heavy school bag promptly dumped on their beds, they were just about to rush into wash room to wash their hands and legs when the heady, sweet aroma wafted from their mother’s kitchen. ‘Wait a minute’, they said to each other and exchanged happy smiles. ‘Are you thinking the same as what I am thinking?’ asked little girl to her little sister in pig tails. ‘Are YOU thinking the same what I am thinking!’ replied her little sister. ‘So tell me what you thinking?’ questioned big sister to her small sister. ‘YOU tell me what you are thinking?’ promptly came back the reply from little sister. They exchanged another secret smile and shrieked in delight! 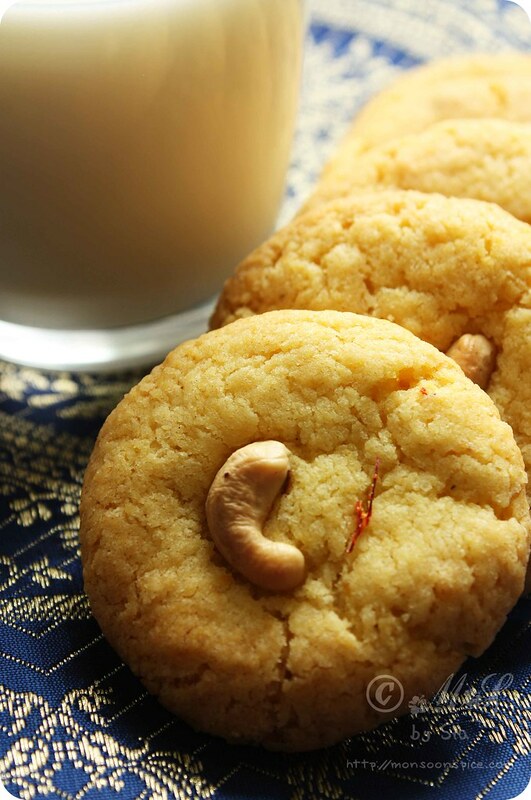 Yes, their mother was indeed baking Nan Khatai, a delightful Indian cookies/biscuits laced with hint of aromatic spices and sweet sugar and ghee. Amma used to make them for us days before the conventional ovens were part of Indian kitchens. In fact, my Ajji (Grandmother) used to make them decades ago when ovens were introduced in India. Yes, no electric or gas ovens but they still managed to bake these Nan Khatai on stove top. These cookies were made using make-shift ovens. What my Ajji and then my Amma used was a large steel or aluminium plate placed in a large, heavy deep pan with sand at the bottom and a lid with a vent. The Nan Khatai dough was placed on this steel or aluminium plate would slowly get cooked by the dry heat from the sand at the bottom of the vessel. It was a long wait but boy, one bit in to this delicate, crumbly cookies and that entire long wait seemed well worth it!!! We’ve came a long way from make-shift sand oven to the modern day electric and gas ovens. But my fear of baking never let me go near it unless I had to dump the frozen potato chips/wedges or heat other frozen food. It’s only recently I have become friends (not entirely) with my brand new, sparkling electric oven. Other day when I was talking to my Mom, she mentioned that she made fresh batch of Nan Khatai for my Dad (she’s been using her ever-faithful gas oven for 15 years now!!!). From that day on, all I could think was those crumbly, sweet and eggless beauties. At last I decided to bake some Nan Khatai for my two boys and got the basic recipe from my Amma. The only difference to my Amma’s recipe is addition of Saffron which lends it a rich and warm taste. While my Amma’s Nan Khatai is round, hollow in the centre and little puffed up; this one is rather like a cookie or biscuit. 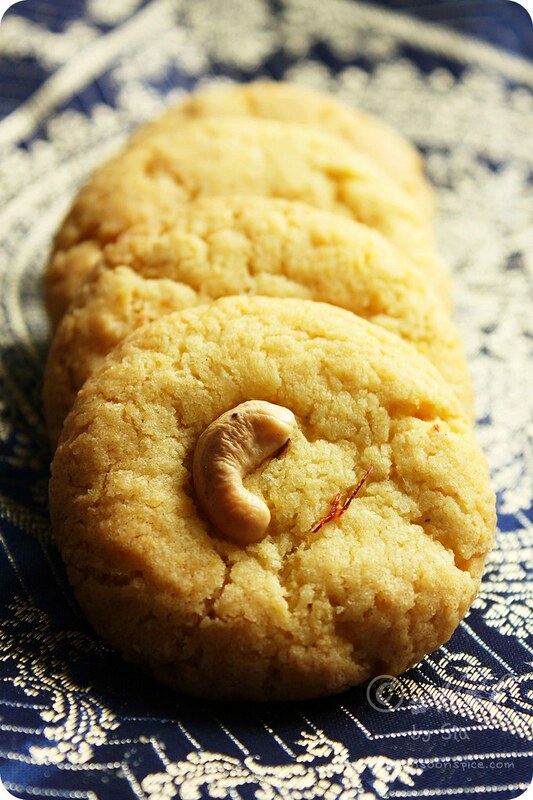 It may not match the classic beauty of my Amma’s Nan Khatai but the taste… Oh, how do I explain! 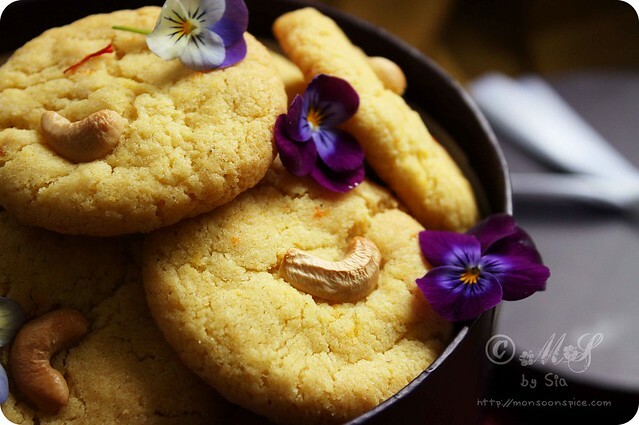 These delightful Saffron Nan Khatai/Eggless Saffron Cookies are delight to eat and for a person who thinks she is born without sweet tooth, I gobbled up three as soon as it cooled down!!! 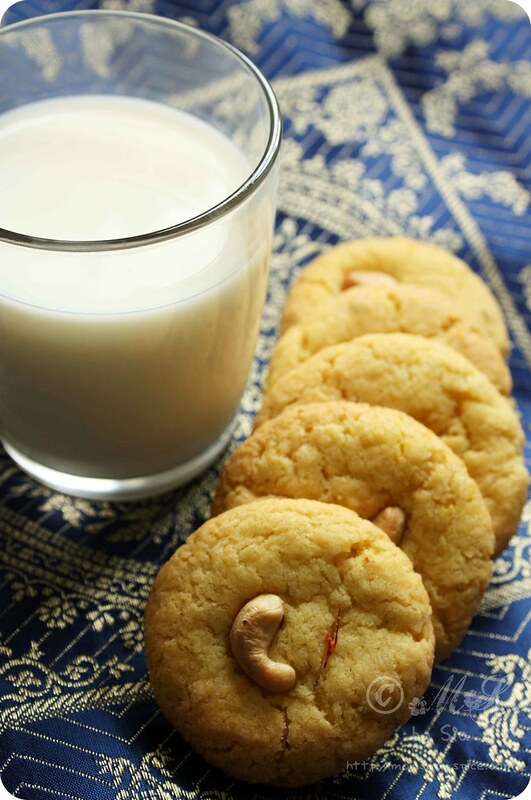 While the cardamom and nutmeg adds hint of warmth, the pure Desi Ghee lends its own aroma and Indian-ness to this Saffron Nan Khatai/Eggless Saffron Cookies. And both my boys loved it so much that they think I should patent this recipe ;) Well, I am not that selfish! 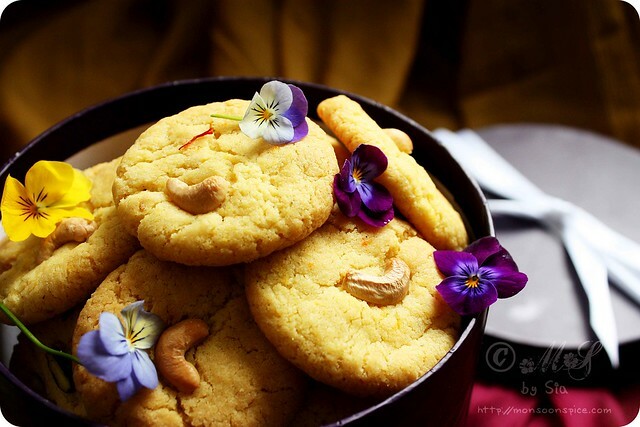 So why not try this Saffron Nan Khatai/Eggless Saffron Cookies on this festive occasion of Navratri and surprise all your loved ones with something sweet, rich and delicious? 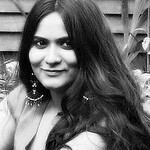 Wishing all the readers of Monsoon Spice Shub Navrathri! May Maa Durga empower you & your family with her Nine Swaroopa of Name, Fame, Health, Wealth, Happiness, Humanity, Education, Bhakti and Shakti. Pre-heat the oven at 180 deg C. Line the baking tray or sheet with aluminium foil or baking paper and keep it aside. 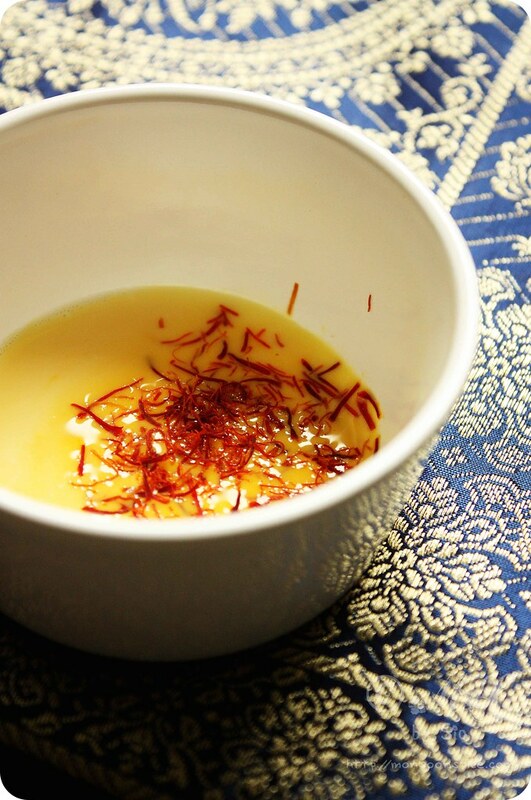 Take sugar and ghee in a mixing bowl and add saffron dissolved in milk. Mix them well till sugar and ghee are incorporated well. Next add Maida/all purpose flour, baking soda, crushed and powdered spices and a small pinch of salt and mix them well till you can form dough. If the dough is too crumbly or powdery, add a tsp of milk at time till you can form dough. Make small lime sized or large gooseberry sized balls and lightly press the cashews on top. Place them in a baking tray lined with aluminium foil or baking paper and make sure that there are enough gaps between individual cookie dough. Place the baking sheet in the middle rack of the oven and bake for 12 to 15 minutes. Once baked, take the cookies from baking tray/sheet and place them on cooling rack. Don’t worry if you find the cookies to be little soft as they will harden once cooled. 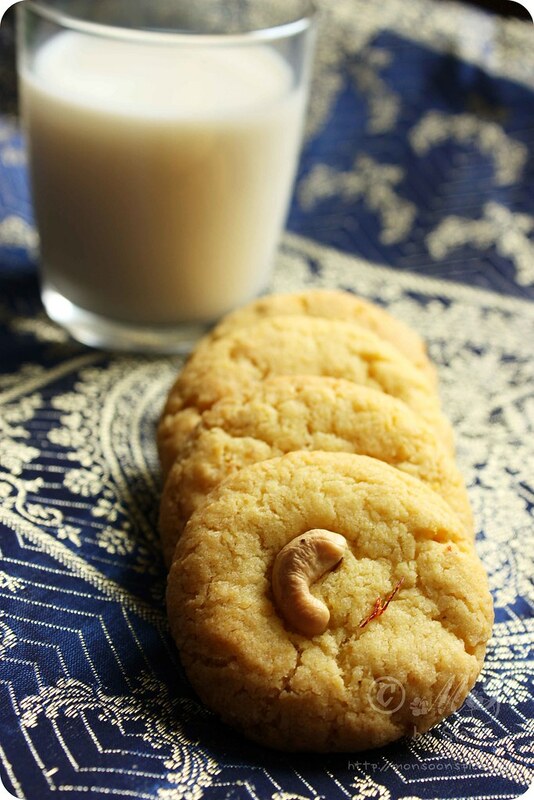 Serve with a glass of chilled milk or coffee or tea and enjoy this Saffron Nan Khatai/Eggless Saffron Cookies. Don’t worry if you find the cookies to be little soft when you take out them from the oven as they will harden once cooled. For healthier option, use whole wheat flour or Atta in place of Maida or all purpose flour. You cans tore them in an air tight container for up to a week at room temperature and up to two weeks in refrigerator. Do you want to win a copy of Helene Dujardin’s Plate to Pixel, food photography bible for amateur or for even experienced food photographers! Just head over to my blog anniversary post to read about how you can participate in this Giveaway. This giveaway is open for everyone and the prize will be shipped worldwide!!!! The giveaway is open till Friday 7th October, 2011. So what are you waiting for? Please hurry up!!! Lovely nankhatais. 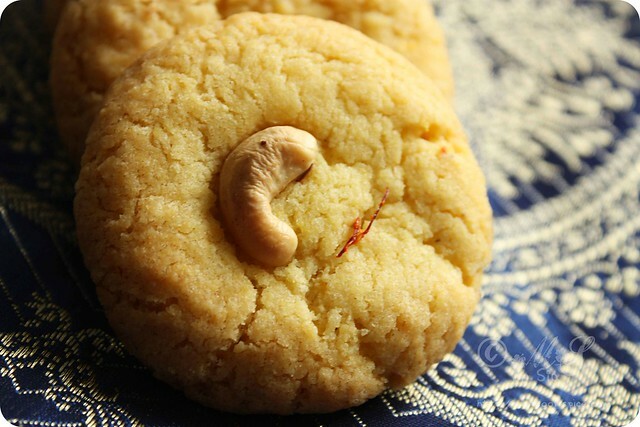 We all have some memory related to this delicate desi version of the shortbread during our growing up years. This happens to be one of my earliest baking attempts and tastiest too. I have tweeted about this post & giveaway. Wow Sia. Even I bake nankatais but I dont think they are so beautifully displayed. sia, both recipe and the photographs rock! keep up the good work. Love the color, texture and how nice they looks, superbly done !!! thats a nice blend for the traditional naan katai..I too baked it recently and yet to post the recipe..nice captures sia..
perfect n crispy cookies...surely will try it...bookmarked! The Nan khatais look so delicate yet have that perfect crunchy texture. And saffron is a wonderful add to the recipe. Baked and presented to perfection, Sia! Lovely nankhatais, looks very nice. These must smell amazing when they are baking! Oh I love nankhatai! The runch, the aroma and richness from saffron! Ummmm! Navratri wishes to you! Used to love those home baked (and neighbourhood baker baked)nan khatais - these look gorgeous!